A singing workshop with the sensational Mim Suleiman. 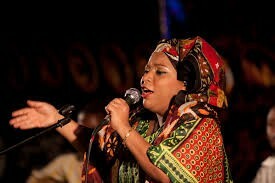 Mim Suleiman brings her love of singing and sharing songs from Zanzibar and beyond to Lancaster. Whether singing in English or her native Swahili, her charismatic and inclusive approach and remarkable range accommodates everyone. Join her for a sparkling session of vocals. This event takes place at The Gregson Centre, Lancaster. Please book through Lancaster Arts.